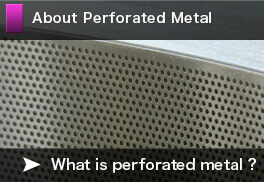 Perforated metal screens are iron, copper, stainless steel, aluminum, and other metal sheets perforated through pressing. Nunobiki Manufacturing provides precision perforated screens for a variety of uses, including centrifuges, filters, fluidized bed dryers, granulators, grinders, and environmental filters, such as dust collection and extraction filters. Specialized in perforated metal since our establishment in 1944, Nunobiki Manufacturing researches and produces its own jigs, tools, measuring instruments, and presses, and has more than 2,000 original dies. We not only manufacture precision-perforated screens with small or multiple holes, and wide and special screens but also weld, bend, profile, and fabricate them. 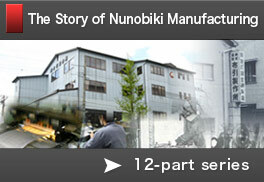 Nunobiki Manufacturing celebrated its 70th anniversary in 2014. 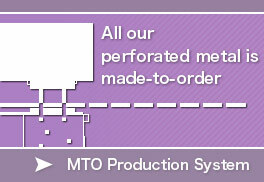 Discover how we began and why we specialize in precision perforated screens (perforated metal). We manufacture perforated metal according to your desired material quality, thickness, hole size, pitch, pattern, dimensions, open area ratio, and other specifications. Once done, we will also handle the cutting, welding, bending, surface treatment, and other fabrication.